MARTINSVILLE, Va. – Mr. Martinsville is back – and with him, a realistic shot at a record-tying NASCAR Sprint Cup Series championship. 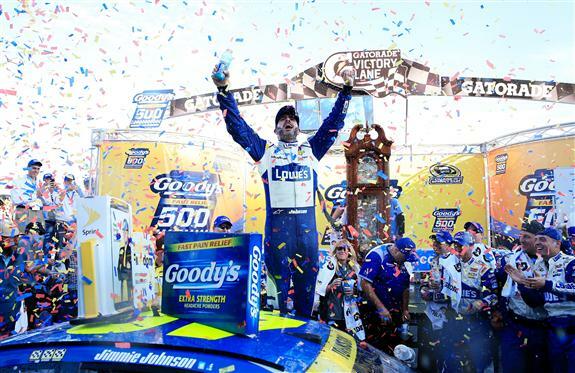 Winless at the .526-mile short track since the spring race of 2013, Jimmie Johnson ended his “drought” on Sunday with a victory in the Goody’s Fast Relief 500 and earned a berth in the Championship 4 race, set for Nov. 20 at Homestead-Miami Speedway. In winning for the ninth time at Martinsville, the fourth time this season and the 79th time in his career, Johnson didn’t take the lead until he passed Denny Hamlin for the top spot on Lap 409 of 500. In a race that featured two green-flag runs of more than 110 laps, Johnson pulled out to a lead of more than two seconds in the closing laps and finished 1.291 seconds ahead of charging Brad Keselowski, who passed Hamlin for second place on Lap 477. Johnson said on Friday he has been trying to avoid thoughts of a possible seventh title that would tie him for the all-time lead with icons Richard Petty and Dale Earnhardt. “I’ve been trying to ignore the conversation about seven, but now I can’t,” Johnson said in Victory Lane. “We’re locked in. It’s crazy to have a shot at seven now. Hamlin led a parade of Joe Gibbs Racing drivers to the three positions behind Johnson and Keselowski, with Matt Kenseth and Kyle Busch coming home third and fourth in a hotly contested race among teammates. Not as fortunate was JGR driver Carl Edwards, who blew a tire and hit the wall on Lap 358 to cause the fifth and final caution. Edwards took his No. 19 Toyota to the garage for repairs and finished 36th, 23 laps down. He enters next Sunday’s second Round of 8 race 32 points behind Busch, who currently holds the last of the Championship 4 positions. The afternoon was nearly as hard on the Stewart-Haas Racing Chevrolet entries of Kevin Harvick and Kurt Busch, whose handling deteriorated after the sun came out mid-race. Harvick, the 2014 champion, finished 20th and Busch 22nd. They are 16 and 18 points, respectively, behind Kyle Busch and in need of strong showings – if not victories – in the next two races. Chase driver Joey Logano finished ninth and is fifth in the standings, four points behind Kyle Busch. Johnson’s mastery of Martinsville may have returned in the closing run, but the day was anything but smooth for the No. 48 Hendrick Motorsports Chevrolet team. Johnson took a shot from Hamlin in the early going, and the contact produced a tire rub that required attention and knocked Johnson back to 25th for a restart on Lap 208. Lap 358 brought a panic attack when Johnson slowed to a stop on the backstretch, having switched off the electronic control unit on his car. But after recycling the unit, Johnson came to pit road on Lap 366 and refueled for the final run, taking the green flag from the fourth spot. “We lost track position through a couple of different means there at the first half of the race,” Johnson said. “Honestly, that caution with the No. 19 car (Edwards) put us in the catbird seat. Notes: AJ Allmendinger started fourth and finished 10th, his third straight top-10 showing. Allmendinger restarted from the rear of the field for the final green-flag run because he had to pit for fuel before pit road was open. He was the final driver on the lead lap… In what is likely his final race in a Sprint Cup car, Jeff Gordon came home sixth in his last substitute role of the season for Dale Earnhardt Jr… Polesitter Martin Truex Jr. finished seventh.